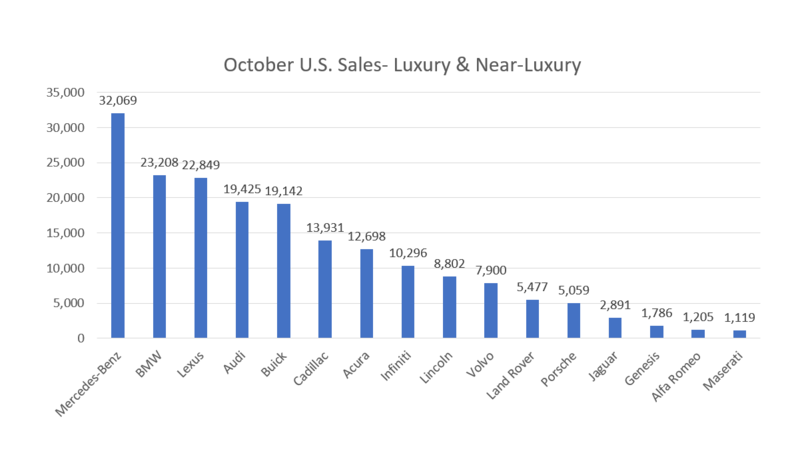 Wow, Lexus and BMW were neck and neck in October sales! Even closer were Audi and Buick, just a few hundred units difference. Mercedes-Benz numbers includes 2,446 van sales, when we remove those the monthly tall comes out to 29,623, still well ahead of second place BMW. So, what is Mercedes-Benz doing so right to be this far ahead? A combination of a robust SUV lineup and its push downmarket with the CLA and GLA have postured the brand to acquire more sales than BMW, which currently has no sedan below the $34,900 3 Series, while Mercedes-Benz has the CLA starting at $32,400. On the SUV side, BMW has no GLS competitor, which Mercedes-Benz sold 2,920 of in October. We hear an X7 is on this way, however until then we expect Mercedes-Benz to continue to eat BMW’s lunch. Looking at the mid-level of sales, Cadillac and Acura are very close. Will the new XT5 allow Cadillac to power ahead of Acura’s aging SUV lineup? About one thousand units separate Lincoln and Volvo. With both brands experiencing a renaissance of sorts, who will move ahead and who will fall back, like whoa? Moving on to the low-volume brands, Land Rover and Porsche were within a few hundred units. Meanwhile, Jaguar is being encroached on by two newcomers to the U.S. market. Genesis and Alfa Romeo both accumulated decent sales numbers given their lack of presence in the marketplace. Behind Alfa Romero and rounding out the group is Maserati with just over one thousand units sold. As the year-end push gets aggressive within throughout the final months of the year as automakers and dealers look to move as much metal as possible, it will be very interesting to see how the current state evolve. Be sure to check in with Third Auto as we track every step of the way. Previous Post - Previous post: October Sales: Which Midsize Sedan Won?